Vintage Tex carries clothing and accessories made before the 1970s, but we can costume plays, movies, TV shows and events set from the Edwardian era up to the present. Download a PDF brochure. Vintage Tex carries a range of unique styles, allowing you to create the wardrobe of your dreams. Whether you're adhering strictly to the traditional interpretation of your show, or going with something a little different, we're here to help! 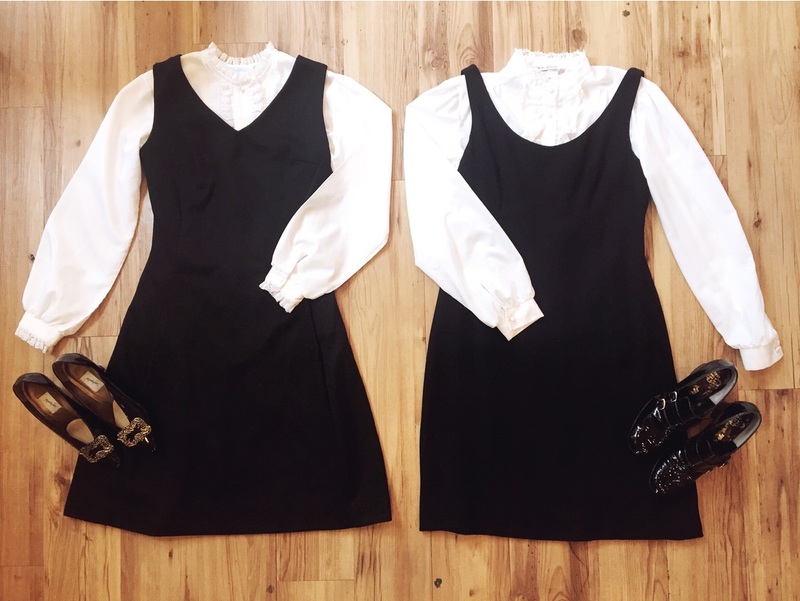 These two 1960s era black dresses with patent black shoes and white lacy tops offer a liberal interpretation of the nuns' outfits. 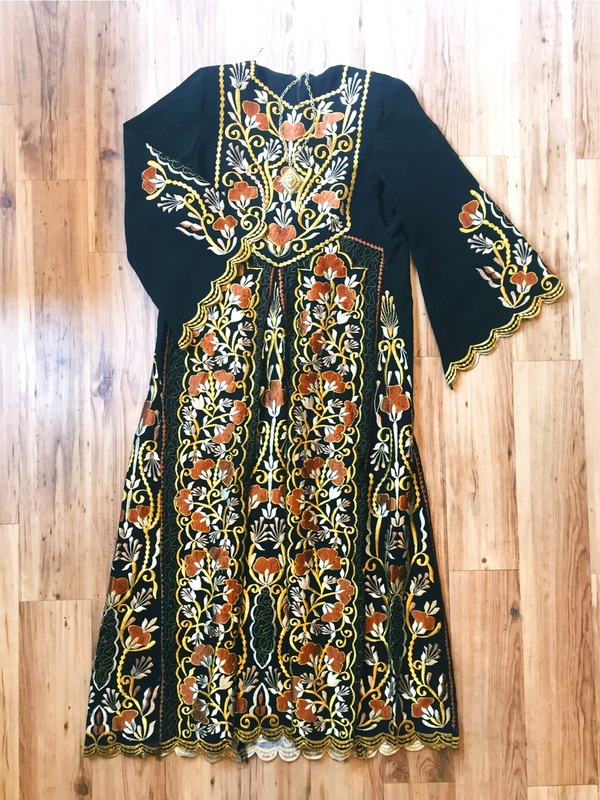 This dramatically constructed and fully embroidered 1970s era dress is perfect for the dark nature of the play. 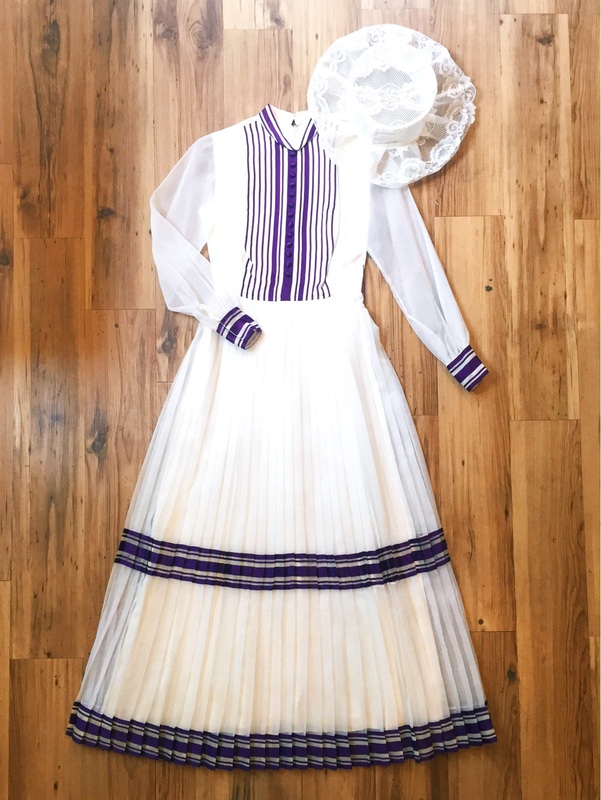 This 1970s era eggplant purple and crisp white gown would make for an ideal Eliza Doolittle ensemble during the Ascott Gavotte number. 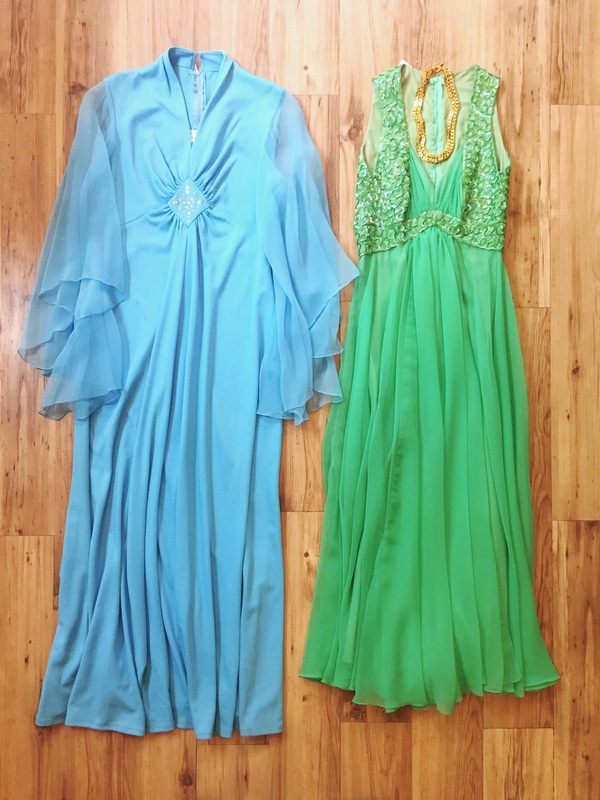 Flowing with dramatic, feminine details that provide exemplary movement, these 1970s formal dresses help to set the mood for the ethereal theme of this play. Perfect for a modern take on the scene where Romeo meets Juliet. 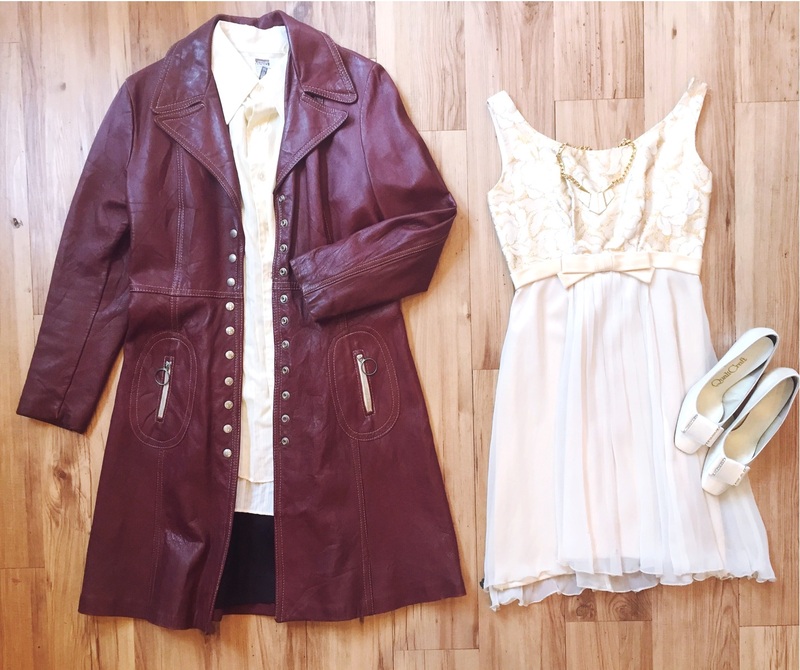 Romeo is costumed in structured creams and maroons, while Juliet is in a 1960s cream and gold baby doll dress to accent her femininity and social status. 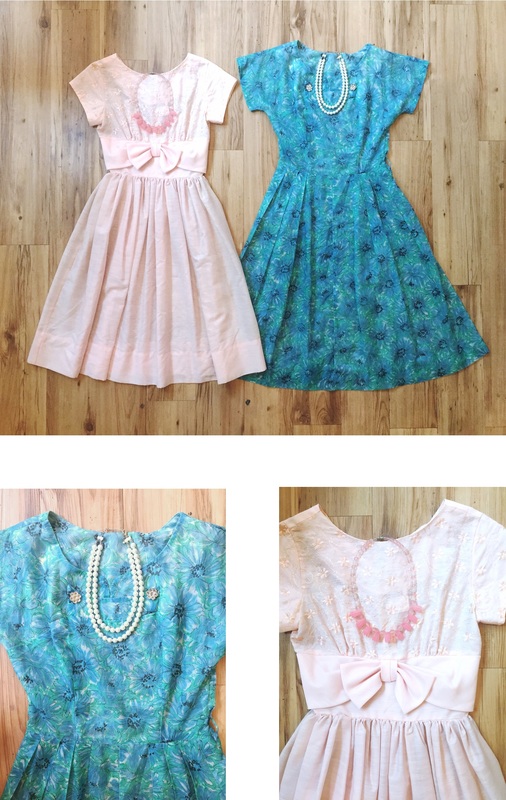 Right: 1950s era pink and blue dresses with necklaces are perfect for the Corny Collins Show! 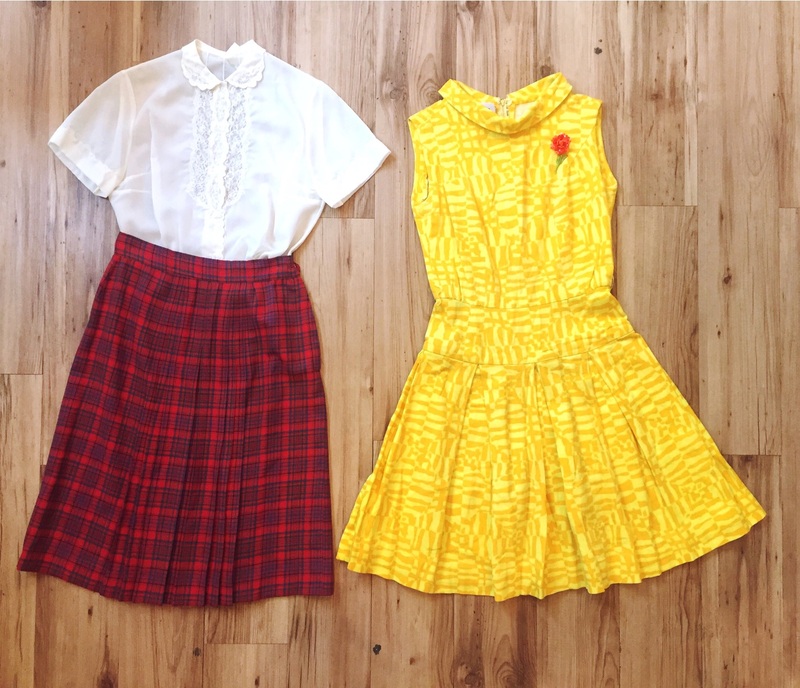 Below: 1950s lace top paired with plaid skirt for Tracy Turnblad's collegiate look, and 1960s yellow dress for her BFF, Penny. Rental prices are a percentage of our retail prices. The more you rent, the more you save! *$200 retail value, $100 rental fee is our minimum rental. - State law requires us to charge sales tax on rentals unless you are tax-exempt. - Only items at our brick-and-mortar store are available for rental. Items for sale in our Etsy store are not available for rental. - Typical rentals are for 1 week. If you need more time, please let us know. We know that you’re on a budget, and we want you to know how great our prices are. So, we’re sharing our actual prices for each of the sample outfits shown in this packet.